The Elo 1515L 15-inch standard format touchscreen monitor is designed for touch with proven Elo expertise and reliability built in. Available in two touch technology options, both offer a sleek bezel design with responsive single touch capability. Multiple mounting options are available to ensure installtion flexibility as well as tabletop accomodations for desktop applications. Marketing Information: The Elo Touch Solutions 1515L touchmonitor is designed, developed and built to provide a cost-effective touch solution for system integrators and VARs. It packs Elo quality and reliability into a integrated, affordable touchmonitor with a footprint smaller than a standard 15" display. This cost and space-saving touchmonitor is "designed for touch"- the technology is built into the 1515L from the ground up and not added as an afterthought by altering the original monitor. It includes a stable base, with controls that are placed on the side rather than the front and are locked-out for public use. The 1515L can function as a desktop or wall-mounted unit and includes a VESA mounting option. The optional 3-track magnetic stripe reader (MSR), is easily installed by the user, providing an elegant, integrated solution. The display is factory sealed against dirt and dust, and the unit offers a choice of touchscreen technologies: the anti-glare clarity and superior performance of IntelliTouch surface acoustic wave, time- tested AccuTouch five-wire resistive, and IntelliTouch Pro projected capacitive (PCAP) for a multi-touch experience and zero-bezel, seamless design. 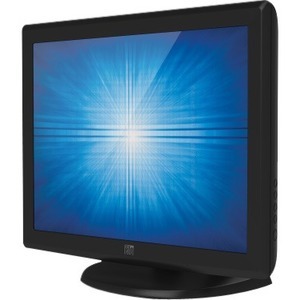 The Elo 1515L 15" LCD desktop touchmonitor provides an affordable product in a convenient, space- saving design that both first-time and experienced users can deploy more easily, reliably, and more cost- effectively than ever before.